It’s that time of year again. The leaves are turning, a crisp chill is in the air and Harvard will again have the chance to trounce Yale in the 133rd edition of this famed rivalry. With Crimson victories in 14 of the last 15 meetings and Harvard undefeated in the Ivy League to date while Yale struggles with a meagre 2-2 record, the stage would seem to be set for another Harvard victory on home turf. But, then, it is THE Game and the odds go out the window when anything can happen. 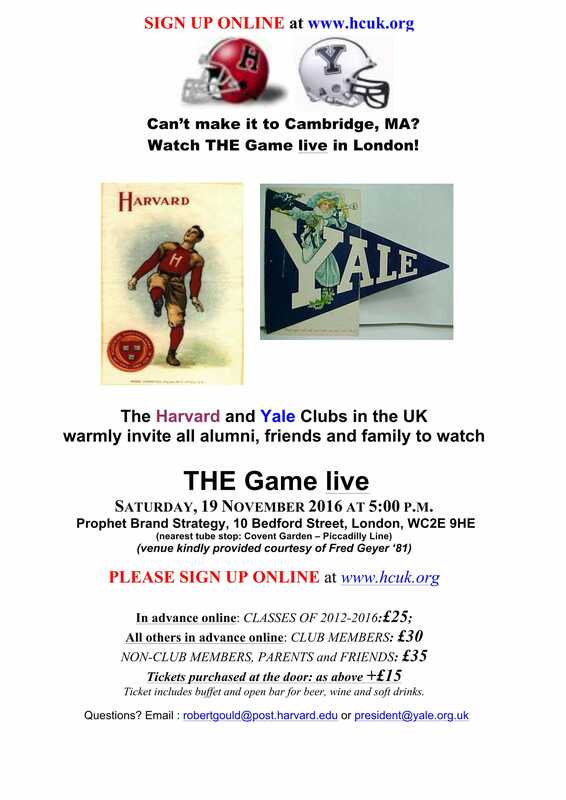 Join us for the live telecast, good tailgating fare, ample libations and the company of alumni/ae, family and friends for what truly is the next best thing to being in Cambridge, MA. While walk-up attendees are more than welcome on the day, please try to sign-up online by 16 November. It will save you significant money and help us plan catering.